I know, I know...I promised sunny-side up eggs today...and this is not sunny-side up eggs. I'm tired, though, and realized I didn't get enough pictures...like the ones of the finished product...and I'm too lazy to go find it in the kids room, take more pics, and upload them. It's okay though, because these mini-canned food cans are SO much cooler anyway and you can find plenty of links to sunny-side up eggs in our MckLinky here. This is something I thought up myself, although it's brilliant and easy enough, that I'm sure a ton of other people out there have done something similar. This is technically not felt food...as in there is no felt or sewing of any kind involved, but somet things are better made from other materials. 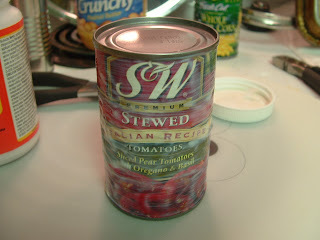 Empty and wash a small tomato paste can. 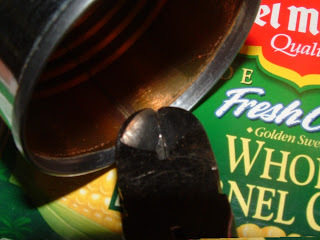 When I open these cans in the first place, I try to angle the can opener in as much as possible to have the cut be very narrow, but there is usually a small pokey thing sticking out where I started opening the can. I use the wire cutters to trim that piece as much as possible. Then I use the pliers to bend what is left over flat against the can. At this point I think the can would be safe to play with anyway...but I don't want to take any chances with little fingers. 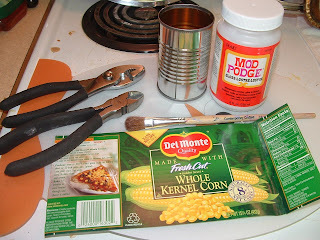 So I take a paintbrush and generously spread modge podge along the cut edge just inside the can. Then I let it dry and you will have a smooth, clear coating over what used to be a possibly sharp edge. Then I took labels from other larger, more interesting cans. I measured the height of the small can and cut the larger label down to size. Don't worry about the length to start out with, because that can be trimmed later. 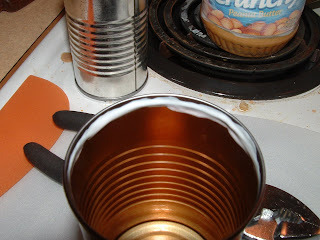 Then I applied a layer of modge podge to the outside surface of the can. 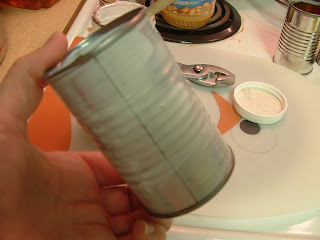 Next, I wrapped my trimmed label onto the can so that the open end would be the BOTTOM of the can. (Of course you can make the top the open end of you want them to be able to pour food out of it.) Then I trimmed the label so it would only overlap itself a little, applied extra modge podge at the seam and smoothed it out. 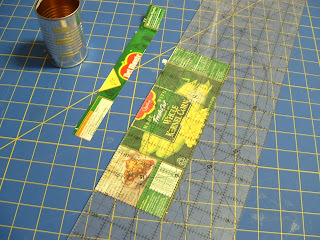 Then I applied a layer of modge podge over the top of the label and let it dry. Here you can see the size of these little cans on comparison to a regular size can. See how real they look next to all that fake stuff in the kids' cupboard? 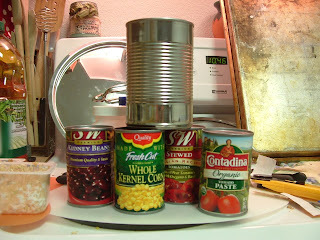 No tomato paste cans are going to be getting thrown out at our house for LONG time because a few of these along with some simple felt food would make a GREAT (inexpensive) gift. These are really cute. They had me fooled! When I first saw them at Firecracker's birthday party, I thought you had found some mini cans of corn...I didn't even realize that the label had been cut down. Great idea. I love this idea! Fantastic. 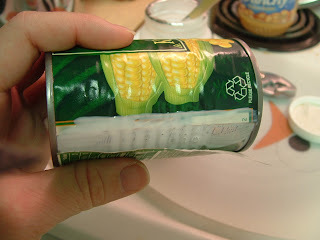 These are a neat idea, Im going to pull my cans out of the recycling right now to do these tomorrow. Thanks for the idea. Love this idea! So regretting the many little cans gone to recycling! I will be saving and doing this craft from now on! 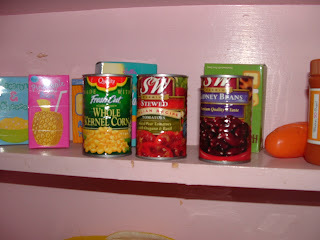 I wouldn't have thought about making little cans for play food. How perfect! Good luck! Fantastic idea! I love being able to recycle something for another use! These turned out adorably! I am currently saving up the Tomato Paste cans, but am contemplating scanning in other labels, resizing the entire design to fit, and then printing out a new label in the correct size. We'll see how it goes! i would never have any cause to use so many tomato paste cans BUT I do have many toilet paper tubes that ive been waiting to use on something. this wouldnt last very long of course, but most toys dont haha thanks yet another great idea! 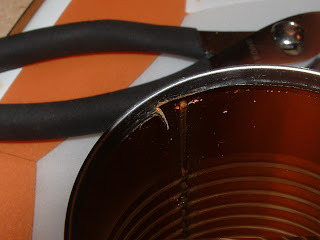 You could use those side can openers (Pampered Chef and Oxo make them)so you don't have to deal with the jagged edges. I may have to do this for my daughter since she just got a kitchen for her birthday. As a preschool teacher, I did a similar activity with can labels and empty frosting containers. 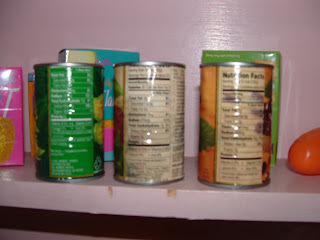 I just mod podged labels on the frosting cans and inserted the ""contents" A splotch for tomato. pizza, or spaghetti sauce, a bunch of yellow clumps for "corn" and "noodles and pcs. of chicken" for chicken noodle soup.